3 comments to Man Bag.. Very well thought out and practical. But what is that I see? A ‘plain’ Nokia phone? I expected you to have an Android system at the very least, Steve! Perhaps, with a broad grin, this is what I have to expect in a year’s time? Roll-on early retirement, then! Very interesting. I have a jacket that goes everywhere with me as well as a back-pack made of parachute material. If it gets too hot for the jacket I unroll the compact bag and roll up my jacket into it, then it’s on my back and out of the way. In the jacket I have the jack-of-all-trades, my iPhone. It’s my notepad, torch, phone, iPod and camera. Also have a small and lightweight wind-up torch as a backup plan. My cheque book folds up nicely alongside my portable iPhone battery charger, which is also flat and light; the chequebook is there in case some swine half-inches my wallet. 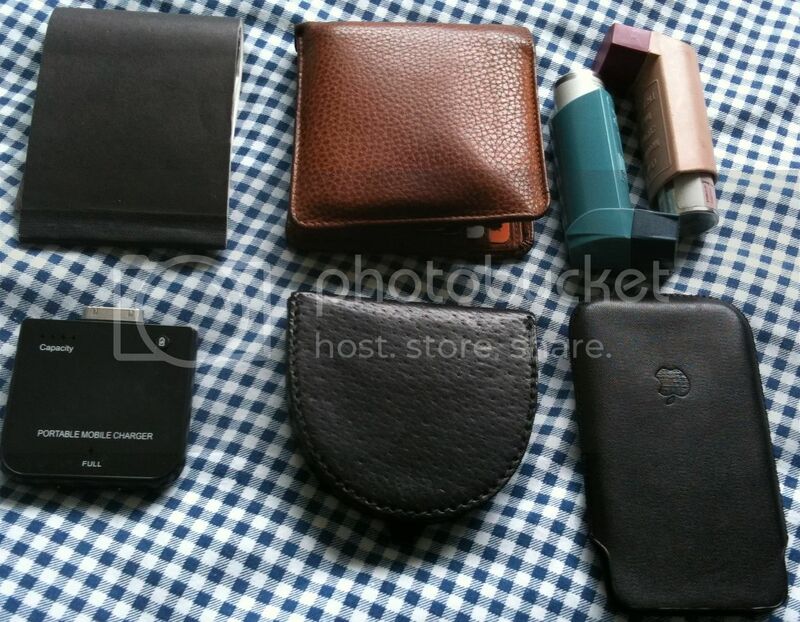 That just leaves a small-change man-purse and my asthma inhalers, which are essential.